Pie was exceptional today! Most days are really good, but today was an extra special one. Pie was interested in going off the property and our first stop was to the printing press next door. There we met a woman who was clearly HORSE CRAZY. She practically melted in the parking lot with nearly visible love hearts floating up off her head. She couldn't even talk because she was so smitten with the big boy. I asked him to walk up and I gave her a treat to hand him. She was just giggling and almost crying about how glad she was that she decided to go to the printer's today. I've been there - we all have - just completely in love with horses and one appears out in public where you least expect it. I turn to mush and this woman did too. Pie was enjoying the hugs and near weeping. He knows that he is a giant, beautiful breath of loveliness. Next, we wound through our woods. The sky was grey and pink and yellow and rainy and not rainy and actually warmish at 49 degrees today so it was amazingly pretty in there for a dreary day. Then he turned left and marched off through the neighborhood. I think his brush with that person made him seek out more humans. We didn't find any, but it still was fun walking through the streets on a sleepy Friday. I dismounted to open a gate and then I couldn't find a suitable place to get back on. I spied a white, five gallon bucket in "George Corner's" yard and borrowed that. (George lives at the corner and has an awfully long last name so we put him in our phones as George Corner and it just stuck.) Fortunately I was trying out Pie's new "roomy" girth so I had a saddle and was able to (barely) get my foot up high enough to reach the stirrup. We lingered around there for a bit then up a hill and around the loud turnpike loop. Pie was strutting because he knew he was such a good boy. Earlier I had worked with him on the "ears up Mother Brodie" command using clicker. Kate over at A Year With Horses wisely reminded me to try clicker with Foggy. Lately, Pie has been making nasty faces when I brush his foretop. I am sure this is from all the dreaded burr extractions. So while grooming, I clicked and treated "ears up" and then got it from him over and over before our ride. My "good boys" verbal proclamations were many and hearty so Pie was feeling robust and happy before we even headed out. The meeting with the horse-nutty woman and the good standing for my remounting had him on cloud nine. He was obviously extremely proud of himself today and he really stepped out looking this way and that walking very tall and intentional. I was equally proud, with a face full of smiley, moon-faced love when we got back to the barn. Horses can just turn your whole world inside-out! Those days are just plain wonderful! Aw...what a sweetie. Sounds like he just made that lady's day! Don't you LOVE LOVE LOVE days like that! It is so restorative to the heart and mind and even human nature. A woman in tears over the joy of seeing a horse? That is so tremendously wonderful. I have been thinking about you A LOT as the fall really sets in (well, today it was winter!) and think about your daily rides all the time. Lucky you. I wonder if you stayed warm this weekend! I actually remembered your puffy carhardt suit! You must have been wearing it for sure! 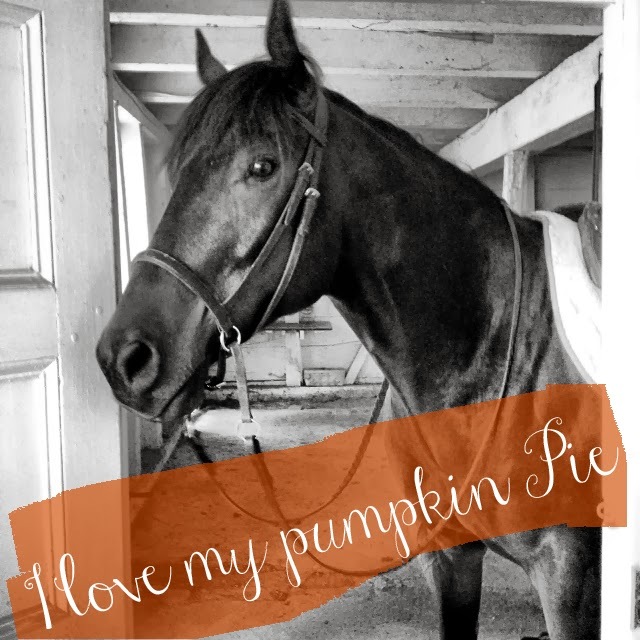 Pumpkin Pie, too adorable! I so 'know' that woman b/c I am her!! LOL. How fun to stroll around without an agenda. Sounds like it was a perfect day for pumpkin Pie. Delicious any day of the year. Thanks for taking the time to visit Honeysuckle Faire! I try to ride every day of the year. My Thoroughbreds are silly, and lovely and bring me great joy. There is no metal in their mouth or on their feet. No lunging or round pens are ever used. I am currently writing an essay about what is working for us and about my beliefs as an advocate for the horse. My paintings are throughout this blog. I like the word sundries. Click image to read how far kindness can take you with horses.